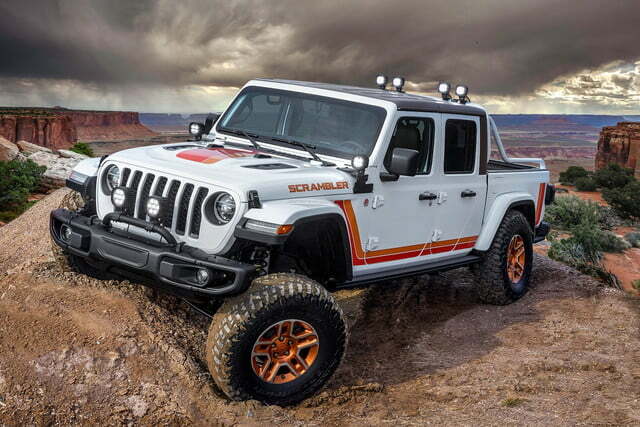 The new Jeep Gladiator pickup truck is ready to get muddy. 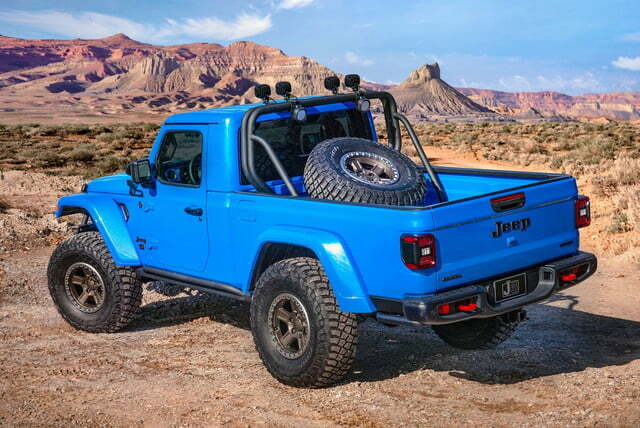 The Chrysler-owned firm unveiled six Gladiator-based concepts that stand out with retro-inspired styling cues, a tremendous amount of power, or both. 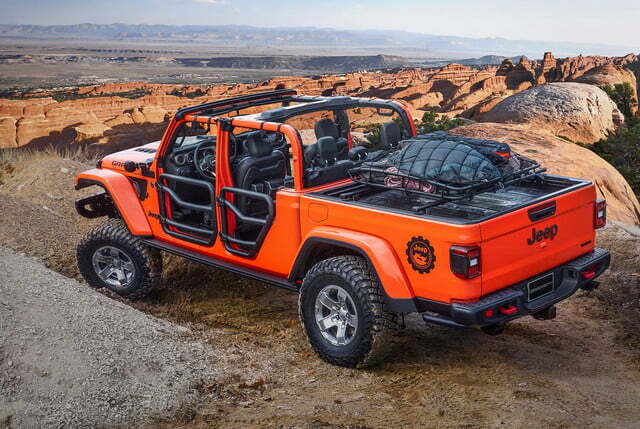 The one-offs will flex their muscles on the grueling trails around Moab, Utah, during the 2019 edition of the annual Easter Jeep Safari that begins on April 13. 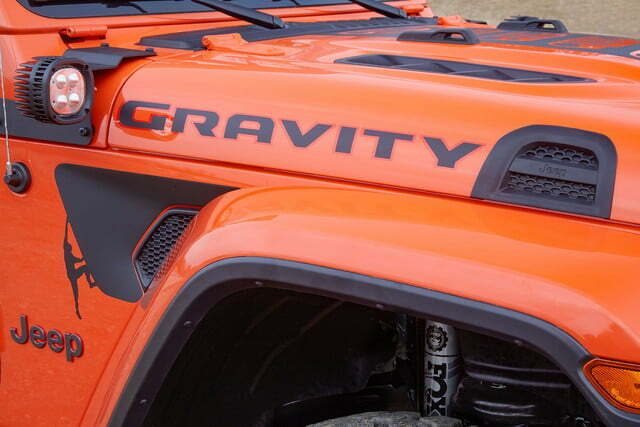 The six concepts are called J6, M-715 Five-Quarter, Wayout, JT Scrambler, Gravity, and Flatbilly. Our favorite is the J6, which shows what a two-door version of the Gladiator aimed at short-wheelbase rivals could look like. Its wheelbase is as long as the two-door Wrangler’s, and ditching the rear bench allowed designers to stretch the cargo box by 12 inches. 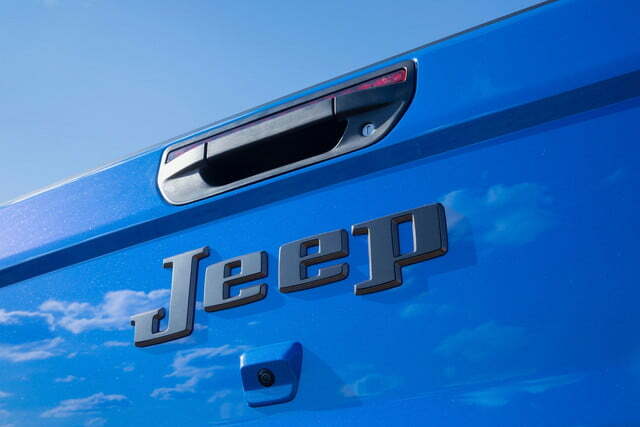 The shade of blue it’s painted in is a tribute to the 1978 Honcho, a model on the same branch of the Jeep family tree as the modern-day Gladiator. The M-715 Five-Quarter isn’t a replica of a classic model; it started life as a 1968 truck built for the American army. Jeep removed the sheet metal and made the front end of out of carbon fiber in order to reduce weight. The front end hides a supercharge, 6.2-liter V8 engine also found in the Dodge Challenger Hellcat, among other models. It’s tuned to deliver over 700 horsepower. Engineers also made the frame stronger, and upgraded the suspension to boost the truck’s off-road prowess. The Wayout illustrates how adventurers can transform the Gladiator into a go-anywhere camper. 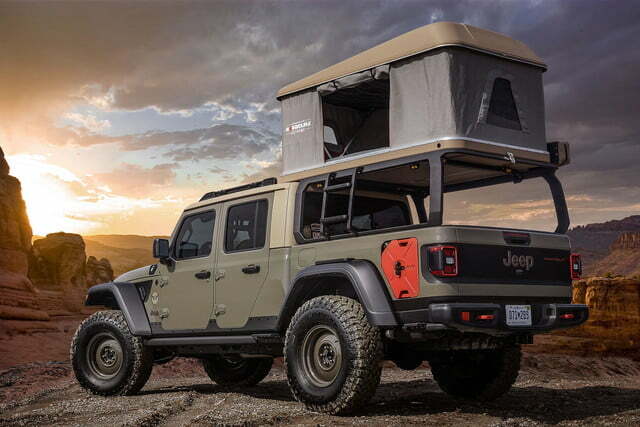 Jeep added a rack over the cargo compartment, and installed a two-person pop-up tent. Two auxiliary fuel tanks integrated into the body and a 2-inch lift kit help the Wayout venture further off the grid than a stock Gladiator. Jeep hasn’t made any mechanical modifications, though. Power comes from a regular production 3.6-liter V6 bolted to an eight-speed automatic transmission. The Scrambler also channels Jeep’s past. It borrows the name of an option package available on the 1980s CJ-8, the Gladiator’s direct predecessor. 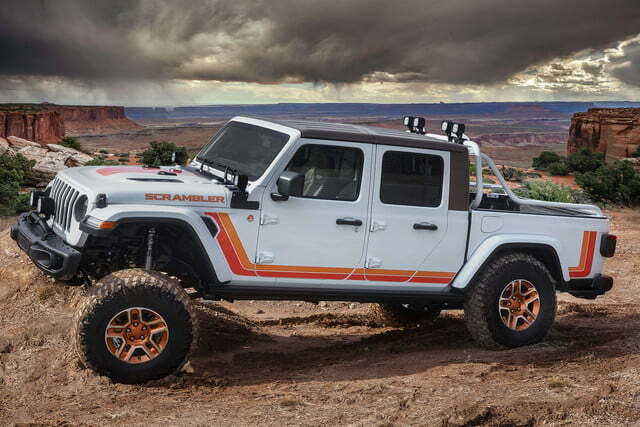 Like the original, the modern-day Scrambler is painted white, and it wears a pair of contrasting orange stripes. 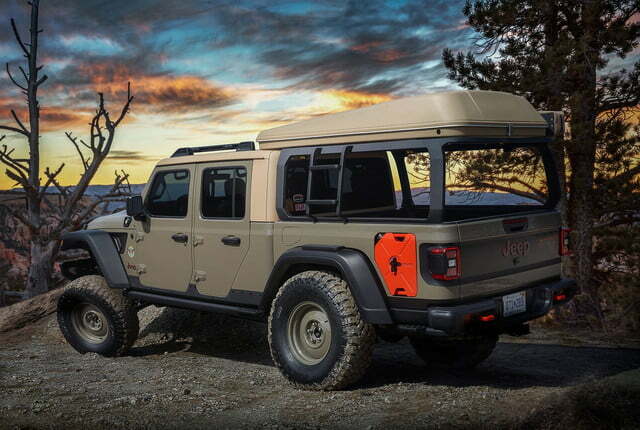 It’s also fitted with a long list of Jeep-designed add-ons, like 7-inch LED lights and rock rails that protect the rocker panels from impacts. The Gravity and the Flatbill both show how Gladiator owners can customize their rig using parts that are available through Mopar. 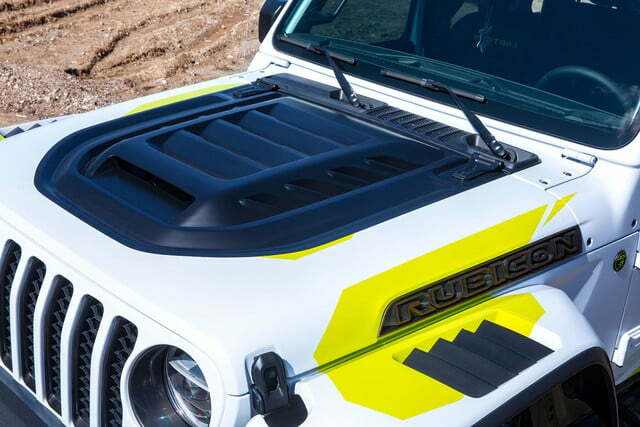 Jeep notes the Gravity takes advantage of the Gladiator’s removable top, while the Flatbill was developed to haul dirt bikes. 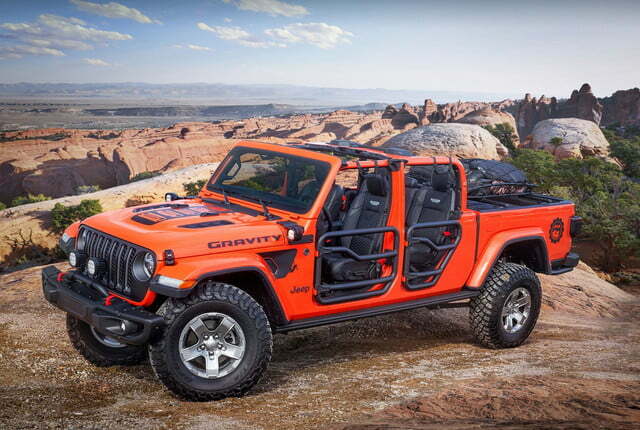 Jeep’s decision to focus on the Gladiator represents a break with tradition. 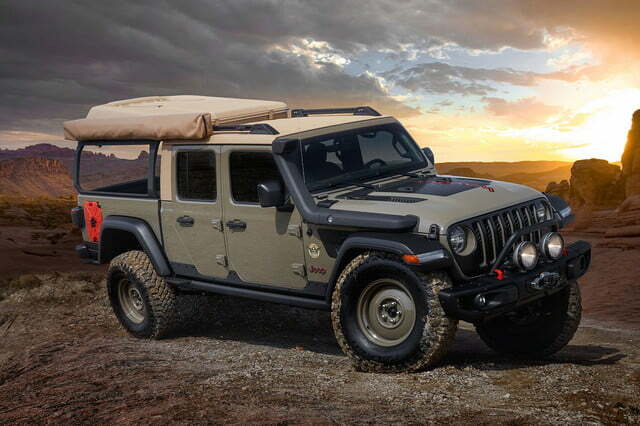 In the past, the company’s Moab-bound concepts have previewed new models, like the fourth-generation Wrangler and the Gladiator that’s headlining the 2019 event. We’ve also seen resto-modded rigs, including a first-generation Grand Cherokee built with modern components. The latest crop of off-roaders reveals less about the brand’s future than we’re used to, but some could preview accessories and option packages that will make the transition from concept to production sooner or later. And, who knows, maybe a Hellcat-powered truck is in the pipeline.